As much as I’d love to write about the recent unveiling of plans to replace the former Plaza mall in Evergreen Park with — surprise! — another mall, I feel like whatever spilled out of me would be an unproductive rant at this point. Since the purpose of this blog is to be constructive, I think I will leave that subject for another time and just say that what I’m hearing about the project doesn’t appeal to me. So what I thought I’d do is focus on a slightly smaller but no less pressing matter of sprawl that crept into our community and can hopefully serve as an example of what not to do in the future. I’m talking about the former Borders building on 95th Street— the monolithic, single-use structure that turns its back to the sidewalk and civilization while a two-block patch of asphalt parking lot repels any vibrancy that comes near it. The vacancy of this site isn’t news. The store closed about four years ago, around the time the chain was closing up shop in communities across the county. The most recent headlines the Beverly location made were last fall when it became the temporary home of a Halloween store, a sure sign that desperation has set in for this property. If the only business eager to occupy the building plans on being around for just a few months, that’s a signal that problems are afoot. I’m thinking about Borders because I recently came across a site called Historic Aerials, which collects overhead photos of places around the country, allowing you to see the macro changes that occur in communities over decades. Since Borders pre-dated my move to Beverly (not to mention my residency in Chicago), I was curious to see what it replaced. As I suspected, I saw that before the once-popular music and book shop moved to the neighborhood in the late 1990s, the now vacant block was filled with very traditional-looking buildings — about half a dozen. Each occupied the bulk of its plot, save for a bit of room for probably owner/tenant parking in the rear, and was built to the sidewalk. In other words, they looked like the numerous other commercial and mixed-use buildings constructed around Chicago and parts of our community until about the 1950s. In the 1950s, this block appears to have been mostly vacant, save for what looks like a house on the southwest corner. By the early 1960s, though, buildings have been erected, and the block is virtually full. In 1964, another building is built on a corner lot, possibly replacing a smaller structure. And it stays that way through the 1970s and 1980s. A block to the west on the future site of Borders’ extended parking lot, you can see another building undergoing change over the years. What we witness before 1999 is incremental growth — individual property owners building up a piece of land over time, likely making repairs and modifications as needs arise. This is how cities and towns were built for millennia until the mid-20th century. It was a tried and true way of building community and building wealth. But along the way, we decided that this was somehow antiquated. Development needed to be done swiftly and on a massive scale in order for progress to be made. And that’s what happened in the case of the Beverly Borders. 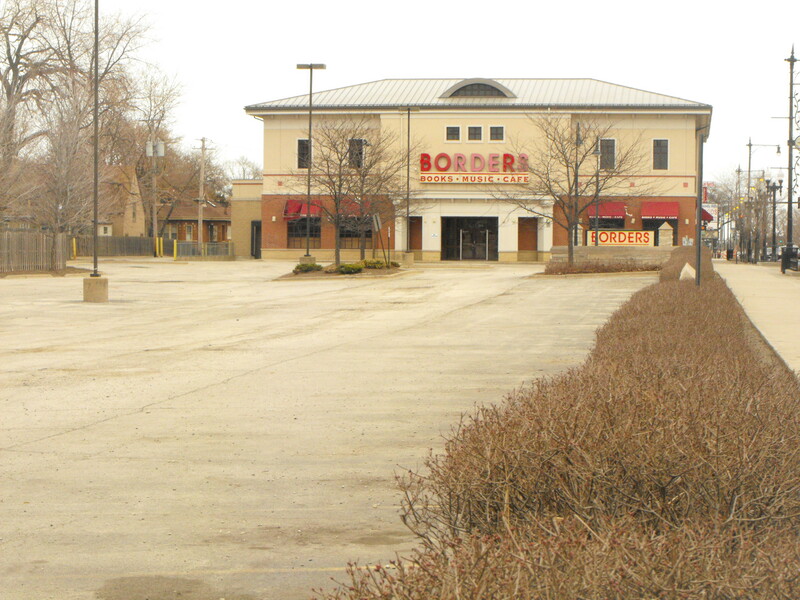 In 2010, the year before Borders closed, the building and its parking lots carried an assessed value of $541,032. It’s difficult to say what the development replaced, so I decided to look at a couple nearby blocks of intact, traditionally built buildings for comparison. I looked at 2010 numbers, so as to get as close to an apples-to-apples comparison as possible. Let’s examine the north and south sides of the 2000 block of West 95th Street, a couple blocks from the Borders. The properties along this stretch cover about 57,500 square feet, a bit less than the 68,500 occupied by Borders and its parking lots, but given the fact that the street frontage is about the same, it’s an apt comparison. The south side of the street contains five buildings of a variety of shapes and sizes. They house businesses including a security firm, a computer repair shop, a realty office, an auto repair facility, a tax preparation office and a clothing store. A couple of the buildings also include dwellings on the second floor. 2000 block of West 95th Street, south side. Just look how much can fit on one block — and with minimal onsite parking, no less! 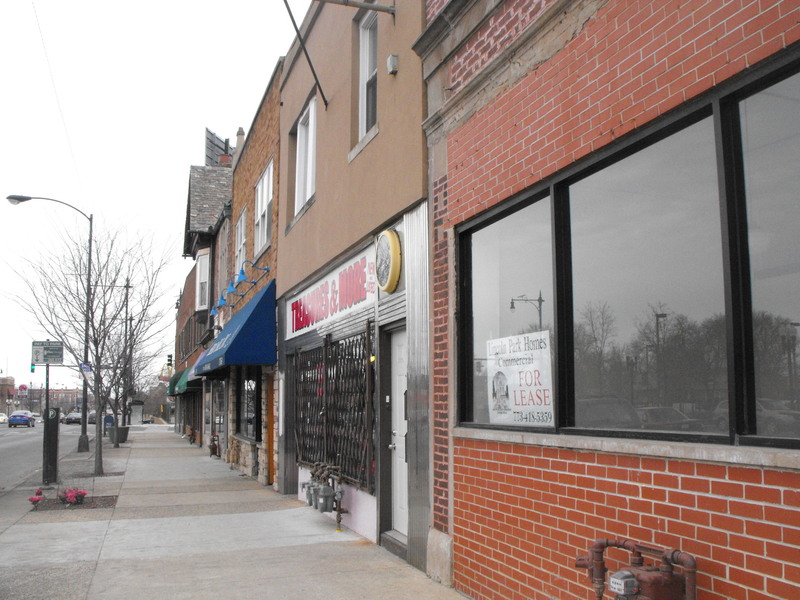 On the north side, you have one tax exempt property (Easter Seals), plus a variety of other small businesses, including healthcare offices and an insurance office, plus a couple apartments. On this block, with its slightly smaller land area and tax-exempt parcel, the multitude of properties had a total assessed value of $555,025 in 2010. That is almost $15,000 more than the fully functional Borders property that year. So what was accomplished by suburbanizing the street with a single use building and adjoining parking lots? I’d argue very little. While the one structure on the property did pretty well on its own (an assessed value of nearly $461,000), the parking lots were an inefficient use of space, especially given the fact that on-street parking is plentiful in the area. Which brings me back to the value of incremental development. Perhaps the Borders could have been viewed as such if it replaced a single building, or if the adjoining parking lots were concurrently redeveloped in a traditional pattern. The purpose of redevelopment should be to improve on what existed before: A single story building replaced with a three story one, a couple two-story buildings replaced with a four story one, and so on. Perhaps something like this would replace a couple single-story storefronts. But when we plan to wipe the slate clean with a single-use building and a parking lot, have we really made an improvement? Borders was certainly bigger, but it wasn’t better. What we got was something that actually proved to be less valuable than what it replaced. Now, four years after Borders shuttered its doors, we still have a large, vacant building that has plummeted in value (to $145,200), while the older, smaller buildings around it still house businesses (and have increased in value, in many cases). When one small building goes empty, it is a prime spot for another small business to swoop in. Because the buildings are of various ages and have various owners, their upkeep and revitalization is constantly in motion. 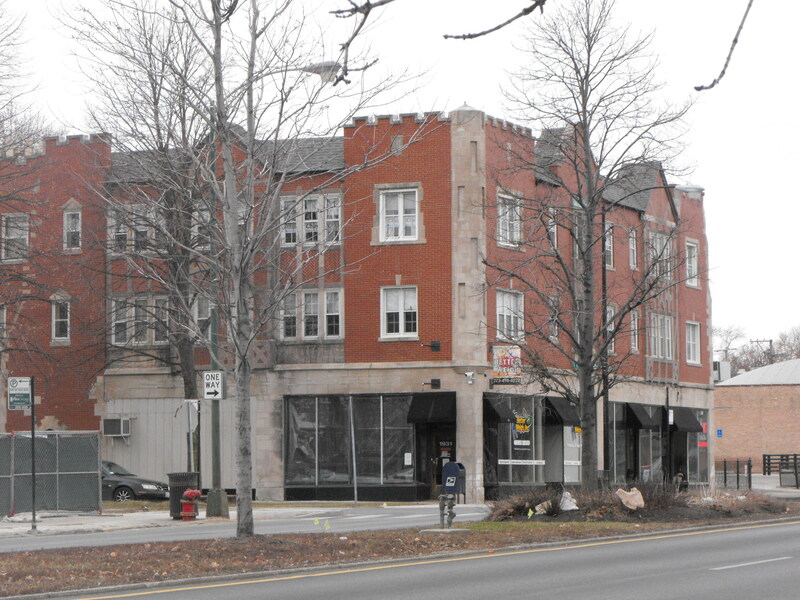 Historic incremental development near the 95th Street Metra station. With a location like that, I can’t imagine the small building on the right will be vacant for long. The Borders building, on the other hand, is a virtual economic crisis unto itself. Revitalization of that property will require a lot more money and planning. That’s the difference between a single-use, single-owner block and a multiple-owner, mixed-use block. The former should never be a substitute for the latter. Four years after Borders’s closing, I hope its shell, visible to all who traverse 95th Street, teaches us a lesson as we think about what will make our community prosperous. The allure of wiping the street clean and starting over with something shiny and new is strong, but growing more traditionally over time really pays off in the long run. JusT an FYI – the building you see in the 1973 & 1988 photos that is now the extended parking lot (situated between Bell & Oakley) was a McDonald’s. I’m not sure when it was built, but it was there as long as I can remember. Every kid in North Beverly rode their bikes there! Before Boarders, the buildings had high vacancy, and Boarders was actually viewed as a savior from blight. The empty and decaying storefronts were often burglarized and targets of graffiti and vandalism. Unsavory elements used the back of the stores for unlawful activity. Boarders represented a community oasis that provided a civic function (literacy), and was going to be the cornerstone of a retail revitalization on 95th street, which still holds vacancies, albeit less now. Unfortunately it didn’t work. A lot of factors have contributed to both the success and decline of business on 95th, including poor traffic, and a resistance to larger corporate centers. Several large spaces sat for years without occupancy because the old urban retail setup was centered around foot traffic, which has now been replaced by auto traffic. Boarders can be subdivided into smaller stores, but this would require a lot of alteration to the building. Hi Matt, thanks for the comment! 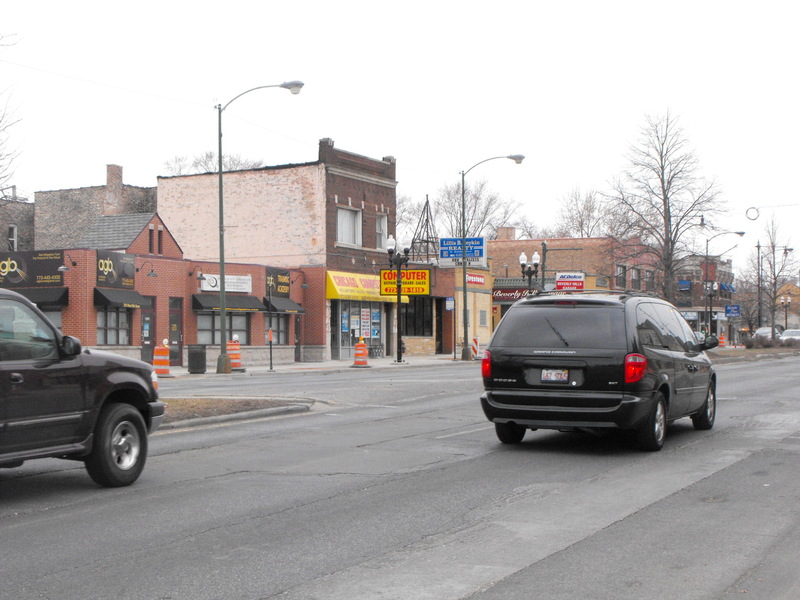 I agree that there are a lot of factors that have contributed to 95th Street’s decline, and I hope we can understand that it is probably going to take, in turn, a lot of changes to turn it around. I’m not opposed to Borders or any business that wants to locate on 95th Street, but I think there is a better way to incorporate even large retailers into the existing fabric of the neighborhood. Even though some of our small buildings are vacant, they are part of the street’s strengths. These are the types of buildings across our city and others that have served as incubators of the businesses that have helped turn neighborhoods around. Even neighborhoods in decline that remained relatively intact, from Wicker Park to Lincoln Park to Pilsen, have been able to build on what they have. I don’t think the wholesale demolition of a block of buildings is what will turn the neighborhood around — I think it exacerbates existing problems. I would love to see a focus put back on the public space on 95th Street and other streets around the neighborhood in order to make the area a place where people to want to linger. Hi Jeff, my brother texted me your dnainfo article and the link to this blog. I live in North Beverly and have lived in the Beverly neighborhood my whole life (except for college and obligatory temporary move north for a year to the Lakeview neighborhood.) I have researched Beverly, sat on the Beverly Improvement Association Board, actively opposed the Meijer & Menards development and spent numerous hours trying to build an enigma-like deciphering machine to crack the code to 95th Street. I have many like minded individuals that I am sure would like to discuss neighborhood issues with you. We meet at Horse Thief Hollow on Mondays around 7:45-8:00 and stay till close. Spring Break is this April 6th so we will be spending this Monday in Florida with the kids. You can email me if you are interested in meeting the 3 or 4 of us for a beer or two in the 13th. Oh, and the building that looked like a house on the south west corner in the 50’s & 60’s was a very popular southern food style restaurant called Mickelberry’s Log Cabin, Google it. A very popular restaurant that reportedly served 350,000 a year and was bombed in 1964.